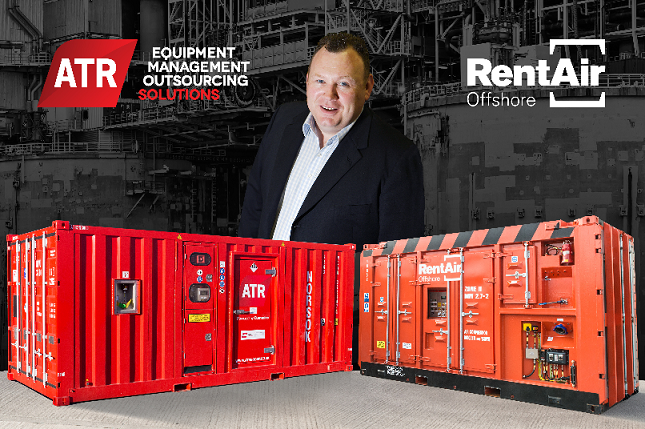 RentAir Offshore and ATR Power Solutions have effectively merged to become one company, offering a broader service to the global energy industry. This follows the successful merger of their parent companies, Centurion Group and ATR Group, earlier this year. The new combined business, which will trade under the RentAir Offshore brand, brings together the complementary expertise, products and services of both companies in the rental of specialist air compression, steam and power generation equipment to support oil & gas production, well testing, fabric maintenance and renewables. Robbie Garden, Divisional Diector of RentAir Offshore, will continue in this role, working alongside Commercial Director, John Cooper – formerly Divisional Director of ATR Power Solutions. George Mess, Operations Director, will continue to provide technical support to the business. Adding the complementary products and services of ATR Power Solutions to RentAir Offshore’s global reach through bases in Aberdeen, Great Yarmouth, Netherlands, Singapore, Australia, and the United States of America opens up new opportunities for both companies. Equally, RentAir Offshore will benefit from being able to tap into the ATR Caspian business located in Baku, Azerbaijan. In Aberdeen, ATR Power Solutions employees are transferring to RentAir Offshore’s premises in Dyce from where the merged business will operate as of Monday 3rd October 2016.